Welcome to the Riverside Yurt – open for teas, coffees and cakes, private functions such as weddings, fundraising events, corporate meetings and even Ballroom dancing. 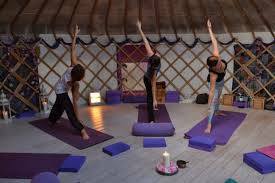 We also hold Boot Camp, yoga and pilates sessions. 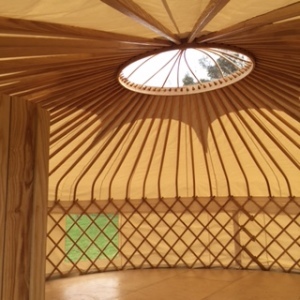 Yurts today are modernised forms of the original – they are works of art where every component is individually crafted and put together like a jigsaw. The are truly beautiful and memorising structures that provide a unique and tranquil environment. The Riverside Yurt is no exception – it sits within the beautiful surroundings of Riverside Cottage overlooking lavender plants and vines. 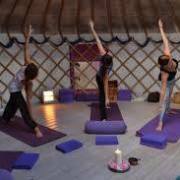 Its high ceilings with clear views to the sky offers colourful and interesting light formations so that every day the Yurt provides a unique setting. Wide open doors allow the outside world to enter in while the wood burner offers coziness when needed. But when shut inside the Yurt you feel completely peaceful and enchanted. Its well worth a visit. The frame consists of one or more expanding lattice wall-sections, a door-frame, bent roof poles and a crown. The Mongolian Ger has one or more columns to support the crown and straight roof poles. The (self-supporting) wood frame is covered with pieces of felt. Depending on availability, the felt is additionally covered with canvas and/or sun-covers. The frame is held together with one or more ropes or ribbons. The structure is kept under compression by the weight of the covers, sometimes supplemented by a heavy weight hung from the center of the roof. They vary with different sizes, and relative weight.